Please note bolt diameter requirements in the Specification Tab to ensure proper fitment. Bore Tech’s CENTERFIRE, BOLT ACTION BORE GUIDES precisely align cleaning rods with the rifle bore and prevent damage to both the firearm and cleaning rod making it a necessary tool for proper cleaning and protection of your rifles. Color coded for easy caliber identification Bore Tech’s Bore Guides fit most popular centerfire, Remington 700 style, bolt action rifles ranging from .17 to .416 calibers. Bore Tech’s Bore Guides feature high precision CNC machined and anodized components providing a lifetime of use. The color coded solvent ports feature widened openings for easy solvent application and a tapered rear access for easy jag/brush alignment. Additionally, the replaceable and solvent resistant molded rubber nosecones are soft enough to provide a superior, long lasting seal and completely prevent cleaners from leaking into the chamber and action areas. Designed to fit both short and long actions, these guides feature an adjustable bolt collar that firmly locks in place via the threaded brass locking handle. While these are a great fit to work as a Remington 700 bore guide, if you don’t see a Bore Guide that will fit your specific rifle, please contact Customer Service to inquire about our custom order Bore Guides. Don’t settle for the cheap plastic imitations. 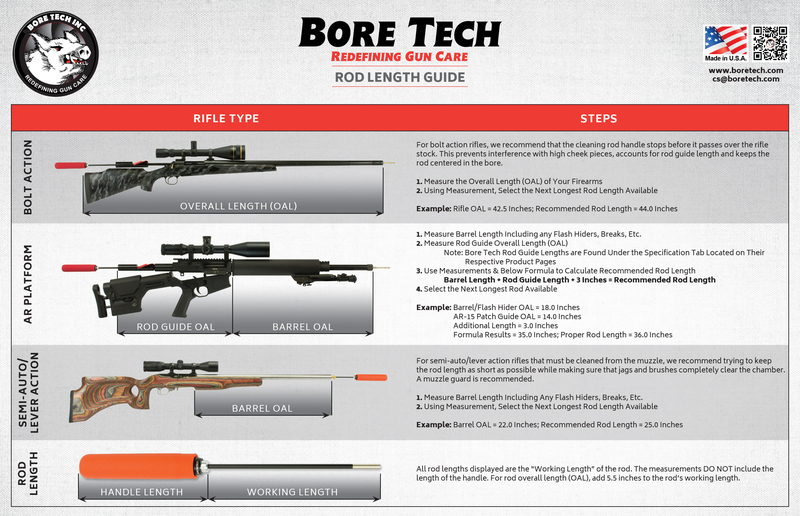 Choose the best… Choose the Bore Tech Bore Guide. For actions with smaller or larger bolt diameters such as Weatherby, Sako, Kimber, CZ, etc., please have bolt diameter to nearest 0.001” and view our BG/PG Custom Collar Page or contact Customer Service. This will ensure the correct bolt collar for your application is received. Bore Tech Cneterfire Bore Guides will add approximately 13.5 inches to the length of the barrel When Cleaning. Make Sure Your Cleaning Rod Is Long Enough To Accommodate. Remove bolt as per manufacturer’s instructions. Loosen the brass bolt collar handle and slide the rubber nosecone (front end) of the Bore Guide through the receiver until seated in the chamber. *Lightly push on the Bore Guide to seat rubber nosecone in chamber. Slide the bolt collar forward until the brass handle is aligned with the bolt handle recess. Rotate the brass handle downward into the bolt handle recess and tighten against the Bore Guide tube. At this point, the guide should not move forward or backwards. NOTE: On rifles without a bolt handle recess, it may be necessary to remove the brass locking handle and slide the bolt collar forward until the threaded locking handle hole is visible in the ejection port. Reinsert the brass locking handle and tighten against Bore Guide tube to properly lock Bore Guide into action. Position a dry patch of the proper size on a jag and insert the rod/jag into the rear opening of the bore guide until visible in the solvent port. Apply cleaner or oil to the patch and push through the bore. The solvent port may also be used to apply cleaner to brushes. To remove the Bore Guide from the action, loosen and rotate brass handle up and out of the bolt handle recess. Then pull Bore Guide and bolt collar back away from the chamber and out of the action. NOTE: For Actions with exposed bolt releases (e.g. Winchester Model 54) loosen the brass handle and leave the bolt collar in position. (The bolt collar depresses the bolt release keeping it from catching on the lip of the rubber nose cone.) While keeping the bolt collar stationary, pull the Bore Guide backwards until rubber nosecone butts up against bolt collar. Then pull both the bolt collar and Bore Guide out together as one assembly. Q: Will these bore guides work on rimfire rifles? A: No, these guides only fit centerfire, bolt action rifles with 0.695” bolt diameters. Please see our Rimfire Bore Guides for this application. Q: Why doesn’t the collar on my Bore Guide fit into my rifle action? A: Manufactures use many different bolt diameters. While most manufactures use a 0.695” bolt diameter, some actions can have smaller or larger bolt diameters. Please measure your bolt diameter to the nearest 0.001” and contact Customer Service to order the correct diameter collar for your application. Q: Do you offer different diameter bolt collar for your Bore Guides? A: Yes, please measure your bolt diameter to the nearest 0.001”and contact Customer Service to order the correct diameter collar for your application. Q: What length rod do I need to use with this bore guide? A: Please see our Knowledge Center for assistance in determining the proper rod length for your application. Q: How long are the bore guides? Q: Why does the rubber nosecone get stuck in the action when I try to remove it? A: Chances are your rifle has an exposed bolt release (e.g. Winchester Model 54) that is catching the lip of the nosecone. For Actions with exposed bolt releases loosen the brass handle while leaving the bolt collar stationary in action. (The bolt collar depresses the bolt release keeping it from catching on the lip of the rubber nosecone.) Pull Bore Guide back away from the chamber until rubber nosecone butts up against bolt collar. Then pull both the bolt collar and Bore Guide out together as one assembly. Q: Do you offer replacement nosecones? A: Yes, replacements are available for sale on our website. Q: What glue do you use to adhere the nosecones? A: You can use any readily available cyanoacrylate – “Superglue”. Your Bore Stix and bore guides are top of the line. I have never seen one of better quality.